One of my oldest friends was over from Canada last week, so we headed down to Oxford to meet up with all the old gang in the pub for a reunion lunch. This kind of occasion has changed substantially now: in the old days we would basically just drink, talk about going to the Zodiac and then fall asleep on the sofa in front of a classic movie from the 1980s, most likely starring either Bruce Willis, Bill Murray, Dan Aykroyd or some combination of the three. Nowadays, there isn’t even any talk of the Zodiac (which doesn’t even exist any more) and the drinking is somewhat moderated by the presence of several delightful children of varying ages. What remains true is that it’s nice to see everyone. There were about 20 of us this time around, and it was really nice to catch up with people who, I realise more with every passing year, are the best kind of people. Most I've known for twenty years, and one or two I've known for thirty years or more. Man and Boy. One thing that caught me a little off-guard this time around was that a number of people looked me up and down and asked me if I had grown. I’m 43 years old now. Surely, if anything, I’m likely to be getting shorter as the ravages of time increasingly make their presence felt and I’m beaten down a little more every day by the ongoing trials of life. Maybe the bar I was leaning on was slightly uphill of everyone else; perhaps the trainers I was wearing had a stacked heel; maybe the skinny black t-shirt and drainpipe jeans I was wearing had a slimming effect that just made me look a little taller than normal; maybe my monastic adherence to a life of self-inflicted hardships really has made me taller…. who can say? Perhaps they’ve all shrunk? 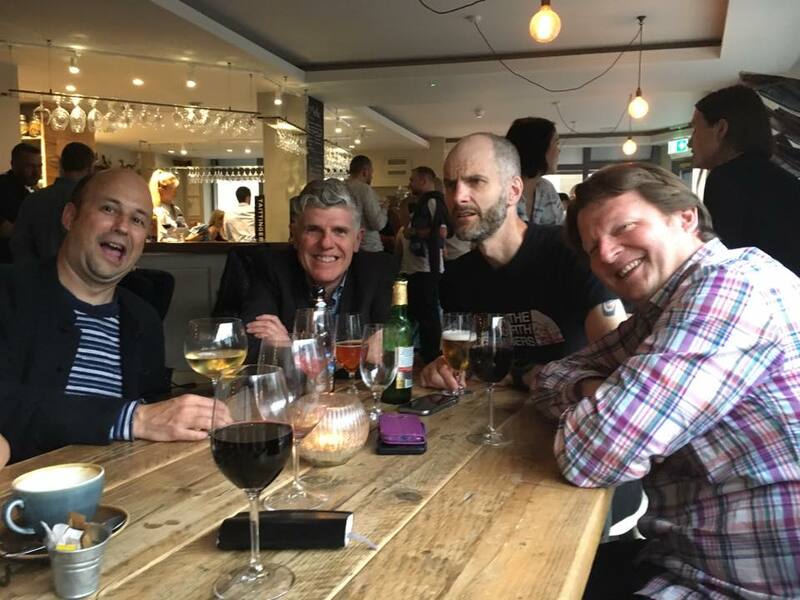 Well, it was nice to see them all anyway, the silly sods.. and I'll be doing it all again when my very oldest friend (on the left of that picture. We met in about 1983, we think) gets married in September. Not to be morbid, but before too much longer we’ll be doing this sort of thing at funerals, and that won’t be quite as much fun, will it?